An essential part of your multicopter is going to be a working, yet stable and light landing gear with plenty of ground clearance for anything you decide to mount underneath. The Tarot retractable landing gear for medium sized multicopters is offered under two different product numbers. For anyone interested, here’s the explanation. Tarot TL8X001 is the landing gear assembly (smaller and larger carbon tube and the metal retraction mechanics). It is only one side, so you would need two of those. The Tarot TL8X002 is the required controller for both (two in total) landing gear assemblies. It is only required once. The TL8X003 is just the metal retraction mechanics that come with the assembly. Finally, there’s another part number: The TL96030 is essentially the same as the TL8X001, but it comes with two 25mm boom clamps for the T810/T960 drone. Depending on the prices, I’d suggest getting either two TL96030 or two TL8X001 and one TL8X002. The parts are very good in my opinion, though the cables are flimsy. Mine was actually broken when it arrived from Asia. Fixed it within a 15 minutes or so. So not a deal breaker, and maybe I’d get a refund from the seller. One more important thing I’d like to talk about. The weight! 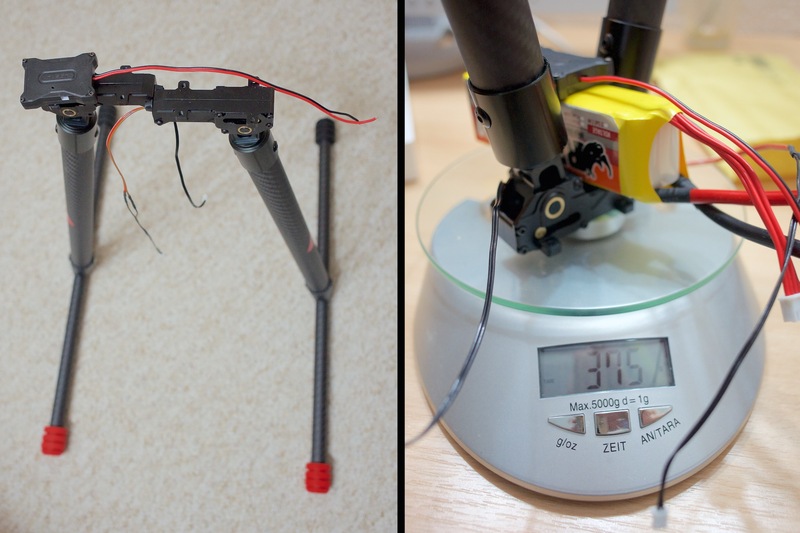 Both landing gear assemblies (without the boom clamps) and the electronics module weigh in at 375g. Don’t mind the battery pack on the photo, it was only used as a weight to keep the landing gears standing and was “tared” out of the total weight.